The episode starts with Ishita’s Appa trying to get Amma attention. Amma says I have much work. Ishita’s Father calls her and asks for water. She says you can take rest. Appa says “okay” you fine. She does her work Appa helps him, and save she asks him to sleep right now, and take rest. Appa is saying to Amma I trouble you so much. She says no, Amma says fine. Do you want anything else? Appa calls her again. She says” what is this ” why are you calling me again and again. I also got old. I can’t run. She said that you tell me what are you doing. Suddenly Raman and Ishita come. Amma says to Ishita look at him. Appa is troubling so much. Appa says to Ishita I apologized. Ishita says Appa is the youngest person in this house. Ishita says its a good news. Raman has left the police. Raman relief to Tannia’s case. Amma says Raman we trust you because you don’t do this. She says I will offer prasad in the temple next morning Appa says who is this, who behind Tannia’s death. Ishita asks I doubt in Parmeet and Simmi. Ishita looks at on Raman. Parmeet and Simmi saw the news. Parmeet and Simmi saw the news both are between argue, Simmi says “my idea flop”, and you blame me. This idea was both of us. Parmeet gets the call to Raghav. He asks “where are you”. He says I will tell your name to the inspector. Parmeet says “no”. He asks why did you kill Tannia. You flopped our plan. Raghav says please save me. Simmi scolding him. She says you don’t threaten us. Simmi is saying to Parmeet you don’t receive Raghav’s call again. Parmeet says you heard him. He tells our name police. Roshni going for a walk. Raghav comes there, and he says Simmi you think you will get rid of me so soon. Suddenly Raghav calls Parmeet. He asks I am close to you. He says you just have 2 minutes. Raghav is saying to Parmeet, I will tell everything to your family. Parmeet says “no”, okay fine give me 2 minutes. Parmeet says to Simmi, I will have to pay him 10 lakhs rupees at any cost. Parmeet says because we have no other option. Both do this, Simmi goes to money. Suddenly, Roshni saw Raghav. She calls the guard. Guard saw Raghav and takes a stick and beat him and he slaps Raghav. Roshni follows down, and She shouting. 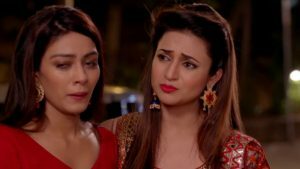 Ruhi and Mihika heard Roshni’s voice. Everything comes here. Roshni cries and at gunpoint. Bala and Raman ask the man attacked Roshni. Raman says Roshni is pregnant. I need to go to her at the hospital. Inspector says I got this id, his name Raghav. The doctor comes and says Roshni is cortical. The doctor says we don’t have time, we have to deliver the baby. Raman comes and says doctor you save Roshni. Roshni takes a promise to Ishita, please save my child and suddenly Diya blows off.